I got to watch the sun rise on New Year’s Eve morning, into a clear sky over the Skagit Valley. During the northwest winter, that means it’s bound to be cold. 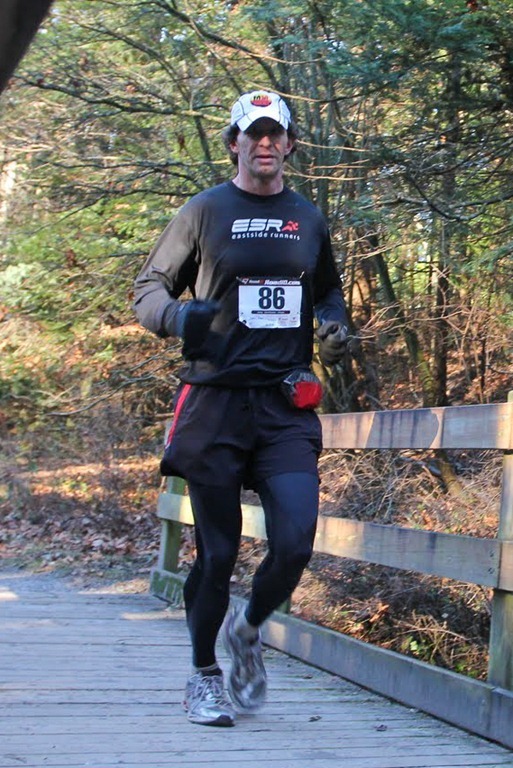 And so it was – a chilly 23 degrees F.
I was heading north to the Last Chance Marathon in Bellingham Washington – the northernmost city in the lower 48. I’d wanted to do this event last year, but had waited a bit too long to commit, and it filled up. It was looking to be a beautiful day. Cold too. For the first time, I would wear long tights during a race. I’d prided myself on running in short sleeves and shorts, even in temperatures as cold as about 28, but the prospect of being out there for about four hours made me think twice. I rolled into the parking lot at Fairhaven Park, about 30 minutes prior to the start. After checking in, and getting my stuff ready, I lined up to begin my fifth marathon of 2010. The race would be a two-time out and back, with a small extension on the out portion. I’d expected the course to be pretty flat, having read it would mostly be on a gravel path. This misconception was corrected pretty quickly. We ran uphill out of the park, and wound around a section of single track, with some nice uphill sections along the way. I felt my pace might be a bit too ambitious, so ratcheted it down a bit after two miles and change. The single track ended a short time later, and we headed up a slight incline along a railroad grade. After we’d been going for a while I noticed a beautiful panoramic view of Bellingham Bay, off to the west. Further study told me that I was running along a several hundred foot dropoff down to the road below too – one wrong step would be very painful. So I made sure I was running along the middle of the trail, rather than sticking to the edge. I’d seen several Marathon Maniac friends out there too. This is not surprising, given the fact the the race was low-cost, mostly self-supported, but promised the chance to do Just.One.More.Marathon in 2010. I hit the first turnaround at an hour even. At this pace, I’d be very close to the four hour mark – which was really my only race goal. On the way back in, I tried to pick up the pace modestly, without getting too tired. By the time I hit the halfway point, I was on pace for a 4:02. And that’s not good. If the four hour mark were way out of reach, that’d be one thing. At this pace though I’d really want to pick up the two or three minutes, otherwise I’d feel like I’d not tried hard enough. And so I did. The second time out, I consciously picked it up a bit. I took the single track a bit harder, and pushed as we headed up the railroad grade. By the time I hit the final turnaround, I was just a tad over the three hour mark, having made up most of the time I’d need. And as I set out for the final stretch, I knew I’d want to pick up another minute or two over the previous pace. Fortunately, the majority of the railroad grade appeared to be a slight descent (hadn’t noticed this before). So I tried to take things just a little faster. Actually I tried to take them a lot faster, but enough fatigue had set in, meaning I was only gaining about twenty seconds per mile now. But every little bit helps – and I felt pretty good as I headed into the single track again, with about three miles to go. I think I like the two-time-out-and-back approach. This means you’re running four 10K stretches, which effectively divvies things up into bite-sized pieces. The emotional effect of running 10Ks is pretty nice – there’s really no time to become mired in the middle miles, as happens sometimes. And so I found myself running the final couple of miles at a good clip, but knowing I didn’t have a bunch of time to lose if I’d wanted to sneak in under the four hour mark. I made the final turn heading into the park with a couple of minutes to go, crossing the finish just under 3:59. Nice race. After catching my breath, I felt pretty good about my effort. Although not close to a PR pace, it was a negative split, reflecting that I’d run a smarter race than other recent efforts. And I’d put a nice cap on 2010 in the process. 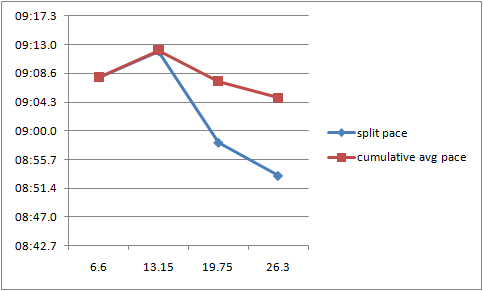 The four splits below reflect a fairly steady pace overall, with a nice acceleration towards the end. I’ll take it! Several years back, Kris and I both tired of the focus on gifts during the Christmas season. We have the good fortune not to lack for ‘stuff’. We didn’t like the way the emphasis seemed to be more on shopping, stuff, and consumption – and not on the spirit of giving (rather than the spirit of shopping). We discussed some alternatives with other family members. One idea considered was establishing a low price cap on gifts. This idea was roundly disliked, because it meant that were you to find the ‘perfect’ gift that exceeded this limit, you couldn’t get it. While this would limit the consumer-focus to our holiday (and require some imagination when shopping), it sort of skirted the issue – limiting but not eliminating the buying. Another idea was to give only things that we’d made. While very consistent with the spirit of the holiday, not everyone is confident in their gift-making abilities. In my own case, I don’t know how many years I would have been able to get away with giving framed photographs to family members. And since I don’t draw or knit, my options from there are currently a bit limited. It also presented some logistical issues for family members travelling – not everything handmade will travel well. What the adults began doing last year was for each of us to identify a cause significant to us, and give them a gift on behalf of the family. On Christmas morning, each of us shares what the cause is, and why it speaks to us. This feels very consistent with the spirit of the holiday, it has the benefit of helping people less fortunate, and it lets each of us share these thoughts with the family. From my standpoint, this makes the holiday more about hope. That’s one of the greatest gifts you can give, isn’t it? From year to year the causes vary – which affords us the opportunity to gain understanding of a broader set of issues that we care about as a family. I thought about sharing some of the causes to illustrate this point, but part of me wants to keep this part private, so as not to encourage comparison or judgment of these things. Different things speak to each of us, and that means we all get to learn from each other. The kids still get traditional gifts, but more and more, they’re shifting to making things for us or for each other – pieces of art, or photo albums. These changes have felt very nice. The acting of giving like this requires us to think about what we value, and how to put these feelings into words and actions. This afternoon, Kris and I visited the Neuro-ICU at Harborview Medical Center in Seattle. Harborview is the premier trauma center in the Northwest. I spent some quality time there two and a half years ago, following my bicycle accident. I’ve done this a couple of times before. There’s something very powerful about literally thanking someone “for everything”. Too many of their patients don’t make it. Others are airlifted to Seattle from miles away. We live less than fifteen miles away, and it’s a great way for me to continue my own healing. According to the staff members we spoke to today, it helps them a great deal as well to hear some success stories. I brought along a letter to them, with some pictures – of me unconscious in the NICU bed in July of 2008, as well as more recent ones of my family and I having fun and living life. My name is Paul David, and I was a patient in the Harborview ICU in July of 2008. While riding my bicycle to work, I had been hit by a pickup truck. My injuries included a collapsed lung, many broken facial bones, broken ribs, broken scapula and collarbone, and lost vision in my left eye. More seriously, I’d incurred a Traumatic Brain Injury. In addition to fractures in my skull, I’d damaged an artery on the left side of my head, which bled into the gap between my skull and dura. I required an immediate craniotomy to stop the bleeding and save my life. A portion of my skull was removed to permit my injured brain to swell and then heal. I was placed into a medically-induced coma for about a week to permit this healing to take place. I spent a month in your care, and in your hands I began the process of healing. I’m very lucky to be here. Through an amazing combination of excellent medical care, good fortune, and wonderful love and support, I’ve been able to recover a good deal from this. The folks at Harborview were a very big part of this. From the time the EMT’s brought me in, I received excellent medical care and was treated with great dignity. My family was kept well-informed and treated with caring, honesty, and respect. Today, I’m able to work, swim, run, drive, and to be an active, engaged parent and spouse. Each day I wake up knowing that I’m one of the most fortunate people on the planet to be here, and to be doing what I love, with the people I love. Please know that what you do makes a huge difference – and I am one story of many. Thank you – quite literally – for everything from my family and I. My intent was to illustrate to them that what they do matters to lots of people, including the patient’s family members. I got to tell them how much I appreciated being able to watch my kids grow up, seeing them perform in a recent holiday play, and to do the things I love, with the people I love. Having family members along with me makes the visit that much more significant too. Seeing Kris swap stories with the nurses was great. 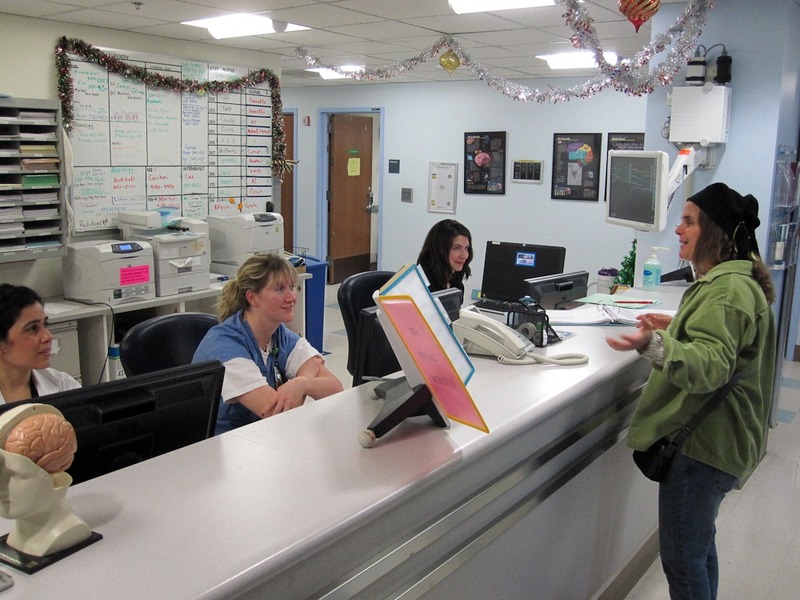 This time of the year, medical folks and first responders alike tend to answer more calls, and to see more patients. The hope is that by hearing how their great work matters, it will help them work through some of the tougher times. For a long time I’ve prided myself on not having a music player or a GPS device when I run. One of the great things about running is that all you need is a pair of shoes, and some clothing you can sweat in. I’ve tried running with a music player before. It’s okay, but there’s something about feeling like I want to futz with the player instead of focusing on running that bugs me. And there’s something great about sensing the world around you as you run. I’ve been out for as long as eight hours without a player, and generally don’t get bored. Your mind is free to wander. You can devote great thinking time to things that are on your mind. And trusting yourself to do this without constantly calculating how long until you’re done is very healthy. Because – running is supposed to be fun. After all, you’re doing this in your precious free time, right? A GPS device is handy for tracking your distance. However, what I’ve usually done is to estimate, based on a rough sense of pace. What this means is that I usually run for time – which can be a good thing. It clears my mind of the notion that I can hurry through a run. The electronic device that I’ve run most with is a heart rate monitor. I’ve rationalized this one because it helps me regiment myself better. Since I lack good pace memory, and don’t always have a good sense of when I’m overdoing things, the HRM helps me ensure that I’m not taking out of the bank too early. Doesn’t require a bunch of attention either. Recently I’ve gotten a new phone, which I can use as a music player and a GPS device. One of the things I’d looked forward to was being able to use this as a “convergence device”. This would be a player for the car that I can listen to music and audiobooks, and a GPS device that I can use to get driving directions. For running this means having both a GPS device and a player as well – if I want it. I’m not always sure I do want gadgetry imposed on my running. I’ve tried it out several times now. It’s definitely nice to have a sense of mileage and elevation for a given route. And I’ve enjoyed listening to music as well. It definitely changes the way I think about running when I’m out there. It’s fun to hear a jazz standard I haven’t listened to in a long time. But it definitely feels like a distraction too. I think about whether the earpods are seated correctly, and sometimes want to futz with the track I’m listening to. And there’s an impulse to actively monitor my distance too. There are also the consequences you inflict on others when you have your headphones on. You don’t hear someone’s polite request to pass you, and (more importantly) you’re less aware of vehicles around you. A number of races have rules prohibiting headphones for these reasons. Some of the unintended consequences can be unusual. 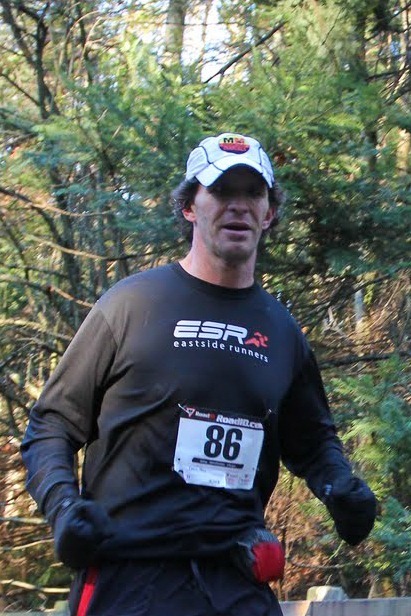 Some years back, I was running a marathon over on Whidbey Island. One of my fellow runners, who unfortunately had a similar pace to me, was belting out the songs he was listening to as he ran. His musical taste was not similar to mine. It sure sounded like it was motivating him, but it annoyed everyone who happened to be within earshot. Today I went out for a nice three hour stint on the trails. No music, and I never looked at how far the GPS software told me I’d run. I focused on the rare late-autumn northwestern sunshine, the nice views from the ridges I was on, and forbade myself from thinking too far ahead of myself on the trail. It was nice. Not terribly fast, but nice. Pretty simple too. I might go for the player sometimes, and will probably track my distance – but I’m still liking the idea of keeping things simple. And as the GPS software I’ve run with recently demonstrates – your mileage may vary.